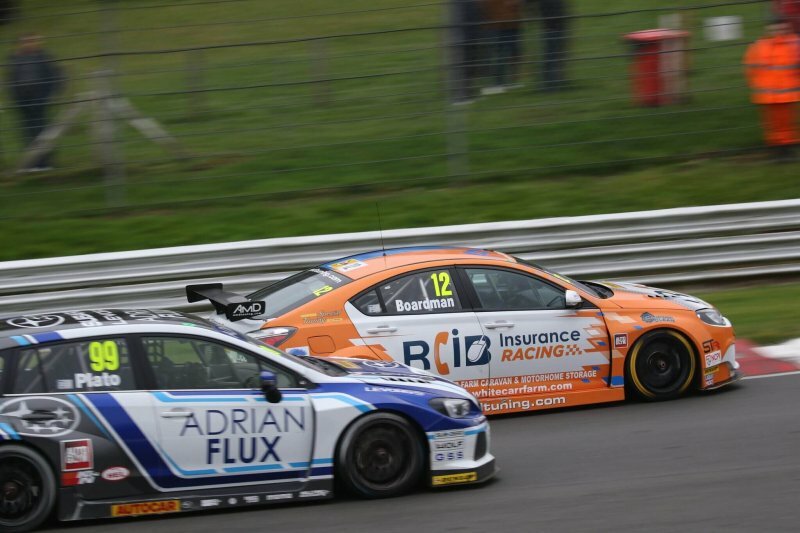 We think we speak for everybody when we state that this seasons start to BTCC couldn’t come around quickly enough. After a rather wet and depressing Winter, Media Day for BTCC 2 weeks prior unveiled a line up of some of the best, and most experienced drivers that has been seen within the series for at least 10 years or more. But winter hadn’t quite let go by the time the first race started with a rather slippery Kentish track (Brands Hatch Indy circuit), before race 2 saw a mixture of 2 seasons in one race which resulted in a rapidly drying track which left to frustrate teams making the wrong tyre compound choice. AmDTuning.com with AutoAid / RCIB Insurance Racing had a rather good weekend at the Brands Hatch Indy circuit with both drivers seeing the points in their very first outing in their new overalls. In race one, the MG6 driven by Rory Butcher came in 13th, with team mate Tom Boardman 5 positions behind in 18th. Not a bad start for the duo, new to the car/team this season. Race 2 saw Tom Boardman finish in an astonishing 4th place with Rory this time trailing in 9th spot. 2 top 10 finishes in only their second every outing…At this stage, the team at RCIB HQ were all biting our nails and for the 3rd and final race we again saw the 2 reverse positions again with Rory finishing a very impressive 6th and Tom in 18th. This excellent start to the season sees the 2 drivers going into the 2nd meeting of the season at Donington in 2 weeks time with Rory 9th in the drivers standings and Tom 15th. AmDTuning.com with AutoAid / RCIB Insurance Racing team position is currently 5th in the independent teams rankings, a position we know the drivers and the team management will all be really quite stoked about. A smiling Rory took the days events in his stride at the end of the day, posting on social media as if to say ‘job done’. True professionalism. What makes us even more excited is that we know for Rory in particular, Brands isn’t even his favourite track this season, so we really can’t wait to see what he does on a circuit he knows and relishes. It’s also worth mentioning the Jack Sears trophy standings which see’s Rory currently occupying the 3rd place position. For those who aren’t aware, the Jack Sears trophy is an annual award made, historically, to the best ‘rookie’ driver to BTCC across the course of the season. This year it’s changed slightly in that it’s not just rookies that can win, those who have never won a BTCC race can also be in with a chance. The other driver with RCIB Insurance Racing sponsorship is of course the excellent Aiden Moffat racing for Laser Tools Racing in his Mercedes A class. Aiden finished in 14th, 5th and 21st positions respectfully.